The Undersea Defence Technology (UDT) summit which took place from 26-28 June at Glasgow’s SEC and was supported by Glasgow City Council triggered widespread condemnation. Hundreds of people, including peace and human rights activists, gathered outside the SEC on the first day of the conference (26 June) to demonstrate their opposition against the event. The organised resistance had planned a ‘lie-in’ protest and a large-scale demonstration including speeches and music. Various groups supported the initiative including Scottish CND, Trident Ploughshares, Scotland Against Militarism, CAAT, Scottish PSC, Global Justice, Food Not Bombs, Palestine solidarity activists and Kurdistan solidarity activists, amongst others. Despite the public outcry a spokesperson for the UDT conference was content to say that they respect the right to peaceful protest. Protesters lined up before 8am as they prepared to confront the arms dealers who attended the conference. Before the official rally organised by the Sink the Glasgow Arms Fair coalition, people staged ‘lie-in’ protest. 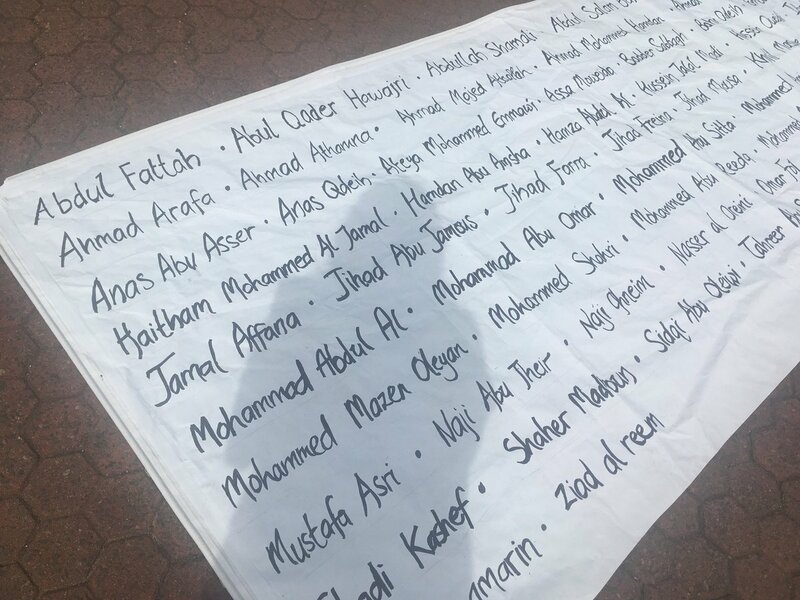 A large banner was placed near the SEC’s entrance, which included the names of all the Palestinians murdered by the Israeli regime at the border protests in Gaza this year (pictured right). Glasgow SNP councillor Graham Campbell spoke at the protest to defend the council’s position, stating that the decision to hold the conference in Glasgow had been made by the previous Labour administration. He stated: “The conference wasn’t booked by this council but if they cancelled it, the taxpayer would have to pay as the organisers would take them to court”. “I have been opposed to the arms industry into the UK nuclear business all my life so it makes no sense to me that this event is happening” Cllr Graham told Bella Calledonia. When questioned regarding the council’s neutral stance and its repetitive refusal to admit that the conference has links to the Trident renewal programme, Cllr Graham said that the confusion was mostly caused due to the lack of ‘good communication’ within the institution. Cllr Graham at Glasgow Arms Fair from Bella Caledonia on Vimeo. Meanwhile police presence massively increased around 10:30am after activists staged a sit-in in the entranceway outside the SEC. Police horses arrived to break up the sit-in in the entrance while people were shouting “this is a peaceful protest, this is a public space”. An activist from the Kurdish Community Scotland and from the group Scottish Solidarity with Kurdistan explained that they attended to highlight and protest the UK’s military support to the Turkish regime which has repeatedly attacked the Kurdish autonomous region of Rojava. One protester was arrested after trying to break into the SEC; another activist, Jamie Watson, was arrested without being informed of the reasons for his arrest or given prior warning. Both were taken to Helen Street police station and issued a $40 fine for a charge of breach of the peace. Protestors gathered on the 27th of June outside the SEC from 2pm under the banner of ‘Arts Not Arms’, where an event with spoken word, music and performance with an anti-war message was held. 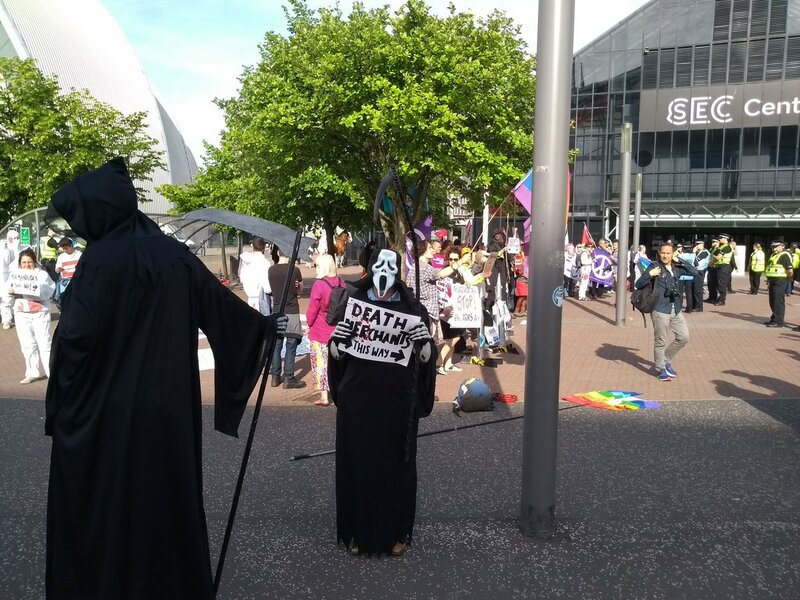 On the final day of the conference (28th of June) activists once again gathered in the same location to highlight that such an event is not welcomed in Glasgow. Peace campaigners doubted efforts by the Council to distance themselves from the latest controversial events when they discovered that hundreds of arms fair “VIPs” wined and dined in secret at one of Glasgow’s most iconic publicly owned buildings in the same day, on the 26th June. “The Kelvingrove Art Museum played host to around 250 attendees of the Underwater Defence Technology (UDT) exhibition, which opened at the SECC earlier that day. The event had been kept secret. Campaigners have expressed outrage at the discovery, claiming the council is actively trying to “cover-up” its links to the UDT arms event. Through Glasgow Convention Bureau, who are managed by Glasgow Life, the council provided support and helped to organise the evening, held in one of the most spectacular public buildings in the city. A spokesperson for the Sink the Arms Fair coalition, who organised the June 26 protest said that the Convention Bureau worked with UDT to find them a space. This choice of venue was not an accident. Neither was the fact it was kept compeletely secret. Both the SEC and Kelvingrove are run and owned by the Council; the Council is therefore directly responsible for the usage of these spaces by the arms dealers. UPDATE: Since this article was written, and in response to the opposition organised against the event, the Council have announced that they won’t be hosting other arms fairs in the future. More information at CommonSpace here. Can these meetings be as effectively pursued if they go underground? I wonder if counterstaging informational events alongside might be more effective opposition? There are several reasons the Palestinian leadership may be about to be consigned to the dustbin of history, one of which is the preponderance of mad, poisonous, conspiratorial, narratives like this. Was there not official orders to use lethal force against peaceful protesters at that series of demos? We all imagined that with our lying eyes I suppose. “peaceful protesters”? Really? Right. Very good. Comedy gold of the week.